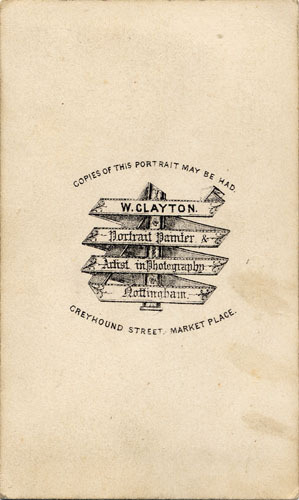 Walter Clayton was born around 1833 in Nottingham, the son of a basketmaker James Clayton (1802-1863) and younger brother to photographer James Byron Clayton (1826-1880). 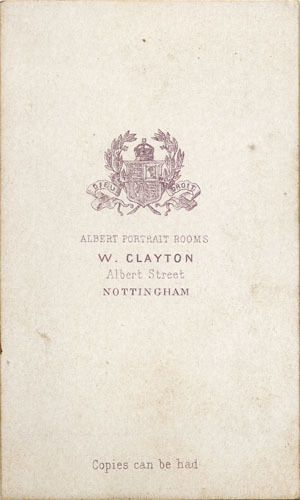 Much of the early history of the Clayton family has been outlined in the profile of James and his son Joseph, who traded in Nottingham under the name Byron from the mid-1850s until 1888. 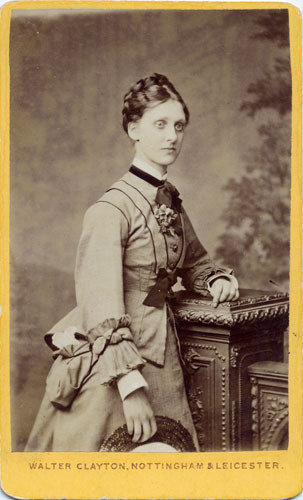 Joseph emigrated with his family to New York in 1888, where the family again built up a successful photographic business, operating until the Second World War. 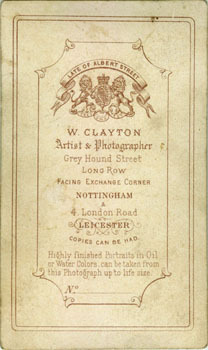 Although there are suggestions that members of the Clayton family may have been taking daguerrotype portraits from as early as 1844, the first documented evidence for a studio is when Walter Clayton opened a gallery at 8 Greyhound Street, next door to the family's basket-making business, before the end of February 1856 (Heathcote & Heathcote, 2001; Anon, 1858). 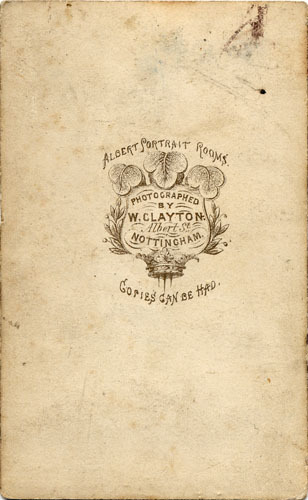 By 1862 he had formed a partnership with David Clayson, a former salesman who had opened a gallery on Short Hill in the mid-1850s and was the first in Nottingham to use the wet-collodion process. 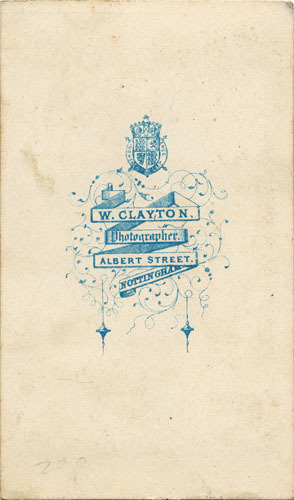 Clayton & Clayson operated from premises at 42 Greyhound Street until at least 1864, and probably until Clayson's death in July 1865. 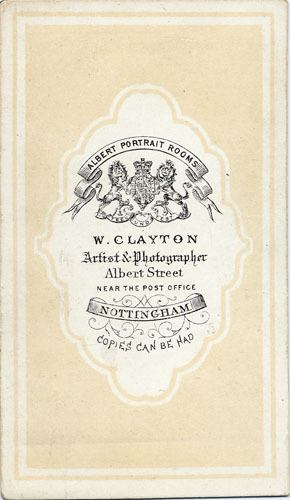 During this time Walter Clayton operated an additional studio under his sole proprietorship, as the Albert Portrait Rooms, at 2 Albert Street, adjacent to the Post Office, and perhaps a somewhat more prestigious location (Anon, 1862 & 1864). 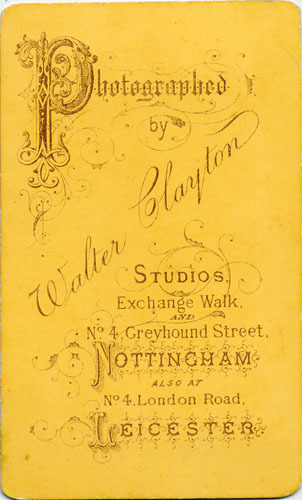 After Clayson's death Walter kept operating both premises, presumably with the help of some assistants, until early 1870 (Anon, 1869; Heathcote & Heathcote, 2001). 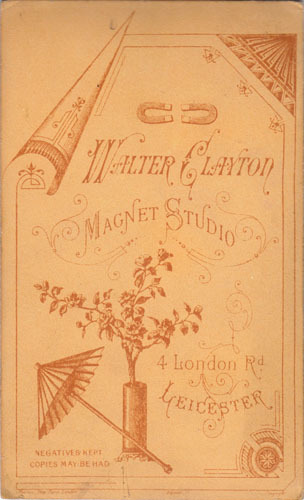 From the spring of 1870 Walter Clayton closed the Albert Portrait Rooms and took over what had been the family studio at 8 Greyhound Street, although he continued to lament his move with the words, "Late of Albert Street," engraved on the reverse of his card mounts for some years. He continued to occupy these premises until 1879 or 1880 (Kelly, 1876a; Anon, 1877). 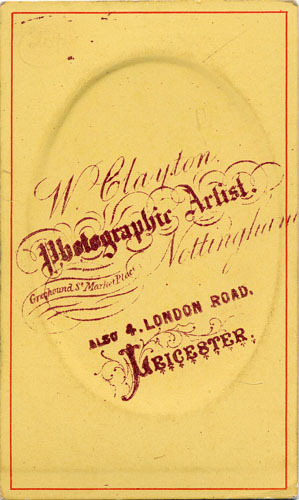 For a period of unknown duration in the early to mid-1870s, although it must have been brief, Walter Clayton was also the proprietor of the Parisian School of Photography at 23 Long Row, Market Place, Nottingham. It is not clear whether this had any relationship with the similarly named outfit in London - perhaps it was an early franchise arrangement. 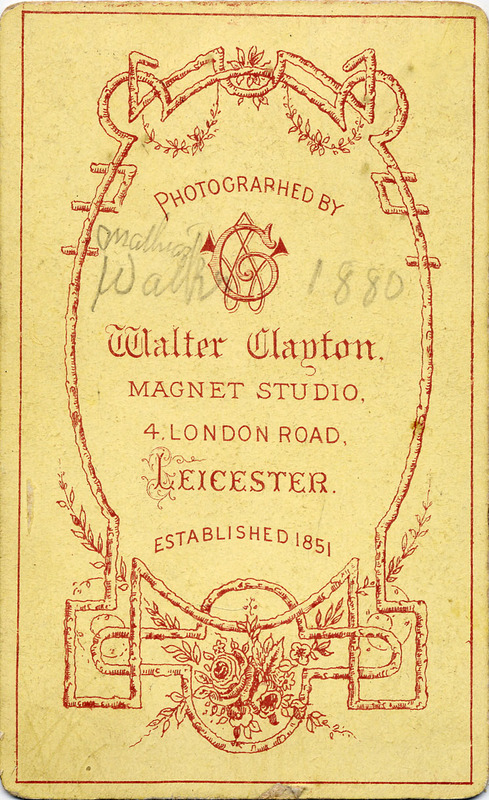 In late 1873, perhaps after the death of his mother Ann Clayton at the end of June that year, Walter embarked on a new venture in Leicester. 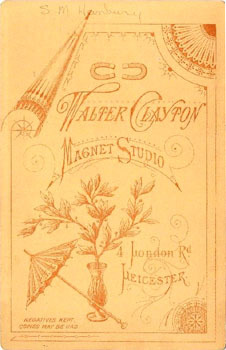 He entered into a partnership with his nephew Joseph Byron Clayton operating the Magnet Studio in Leicester, situated at number 4 London Road. In early January 1874, they announced that had purchased the business of D'Aubigny Hatch at 24 Gallowtree Gate, also in Leicester (Heathcote & Heathcote, 1982, 2001; Anon, 1875). The partnership between Walter and Joseph did not last long, however, its dissolution being announced in The London Gazette of 21 April 1874. 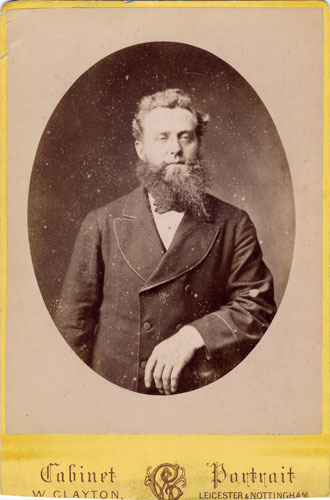 The Gallowtree Gate premises appear to have been taken over shortly after by William Mobbs, who was there from 1875 until 1886, and was followed briefly by F.W. 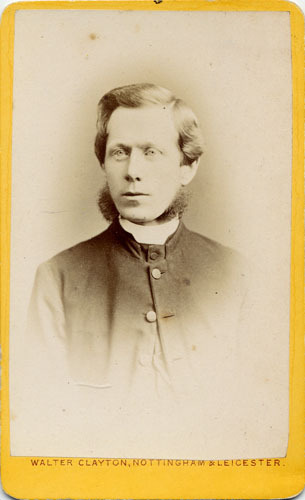 Broadhead in 1888. 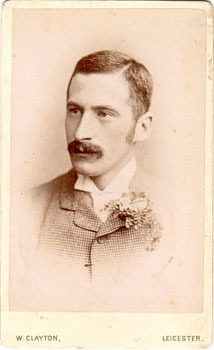 Walter Clayton retired due to ill health in 1892. 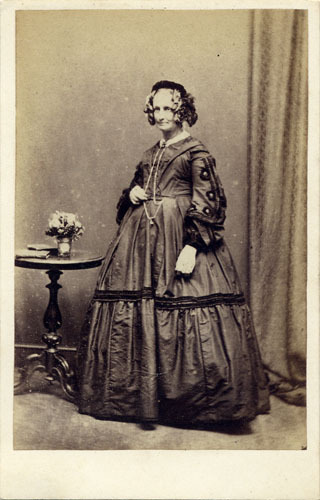 He married Sarah Anne Tomlinson (c1840-1867) at Hull in 1863 and, after her death, was married a second time to Jeanette Annie Wrixon (c1853-1925) at Leicester in 1880. They moved to Bayswater in London upon his retirement due to ill health. 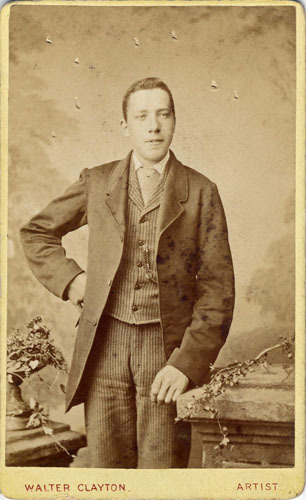 Then on 1 June 1893 he was accidentally drowned after getting into difficulties while bathing at Babbacombe, South Devon. He left no children by either of his wives. 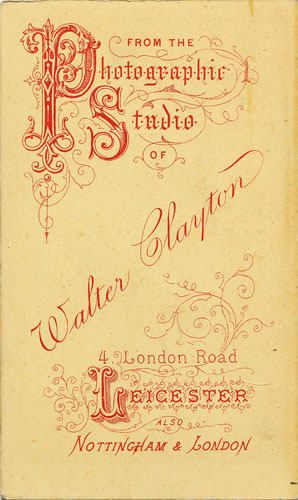 If you have any further information about Walter Clayton, his family and studios, or if you have any photographs by them, please email me. I welcome contributions of images to increase the variety of coverage on this site. If you are able to identify or have an interest in any of the subjects in the photographs shown below, I would also be very keen on hearing from you. 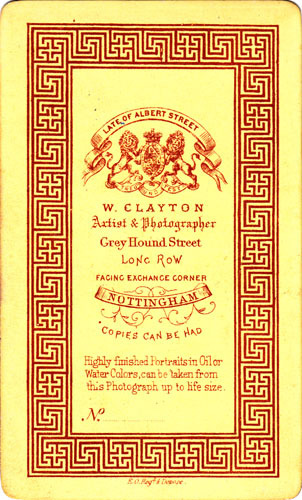 I would particularly like to express my appreciation to Ron Cosens (Photographers of Great Britain & Ireland 1840-1940), who has kindly shared a large number of Clayton images from his private collection. Without this contribution the array of card types displayed here would be not nearly as comprehensive and the dating sequence of far less use. N.B. The sequence and dates provided below are my own provisional estimates, based on information that I have at the time of writing, and may be subject to amendment. They should be used only as a guide to dating. 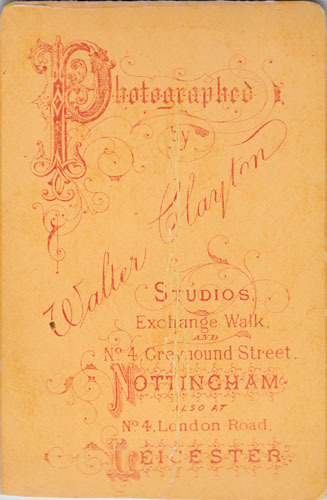 If you have any reliably dated photographs by this studio, images and information will always be gratefully received. Card Type: Type 1 - Crown & cushion, Black ink on white card. Notes: Thin card. Square corners. 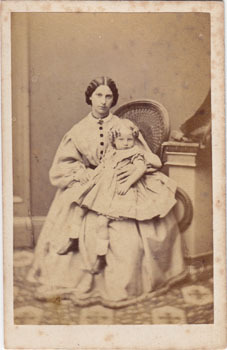 Subject: Unidentified woman and child, full length seated portrait with curtain and plinth. Card Type: Type 2 - Crown & cushion, Gold ink on white card. 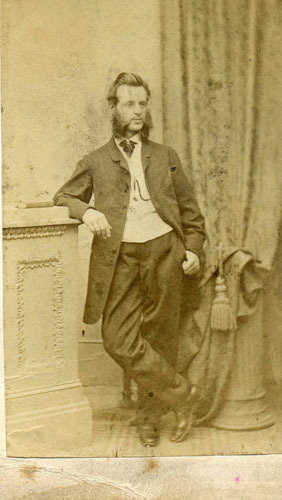 Subject: Unidentified man, possibly in his 40s or 50s, full length standing portrait with curtain and plinth. Card Type: Type 3 - Crown & belt, Blue ink on white card. Subject: Unidentified man, possibly in his 60s or 70s, full length seated portrait with curtain and patterned carpet. Card Type: Type 4 - Crown, coat of arms & wreath, Blue ink on white card. Notes: Thin card. Square corners. "W. CLAYTON Photo. & Artist" in blue ink on recto. Subject: Unidentified man, possibly in his 30s or early 40s, full length seated portrait with curtain, chair, table, bust statuette and patterned carpet. Card Type: Type 5 - Crown, coat of arms & wreath, Purple ink on white card. Notes: Thin card. Square corners. "W. CLAYTON Photo. & Artist" with single frame in purple ink on recto. 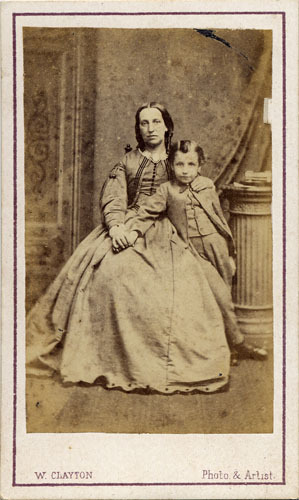 Subject: Unidentified woman and boy, she possibly in her 30s, he aged about 7 to 9 years, full length seated/standing portrait with painted backdrop, curtain, column and patterned carpet. 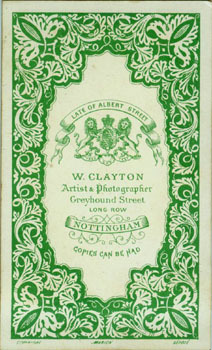 Card Type: Type 6 - Crown, coat of arms & wreath, Green ink on white card. Notes: Thin card. Square corners. "W. CLAYTON Photo. & Artist" with single frame in green ink on recto. 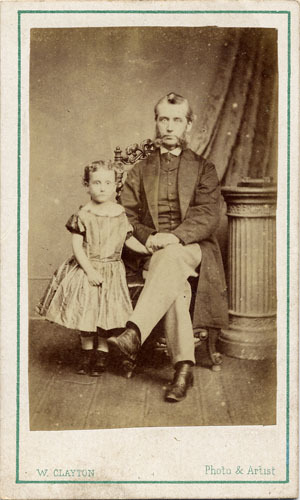 Subject: Unidentified girl and man, she aged about 4 to 5 years, he possibly in his 40s, full length standing/seated portrait with curtain, column, chair and patterned carpet. Card Type: Type 7 - Crown, coat of arms & wreath, Black ink on white card. Subject: Unidentified man, probably in his 30s or early 40s, full length standing portrait with curtain, column, pedestal and patterned carpet. Card Type: Type 8 - Crown, coat of arms, ribbon & Ivy, Blue ink on white card. Card Type: Type 9 - Crown, shield & leaves, Blue ink on white card. Subject: Unidentified woman, possibly in her 40s or 50s, full length standing portrait with curtain, table, vase of flowers, books and patterned carpet. Card Type: Type 10 - Crown, shield & leaves, Brown ink on white card. 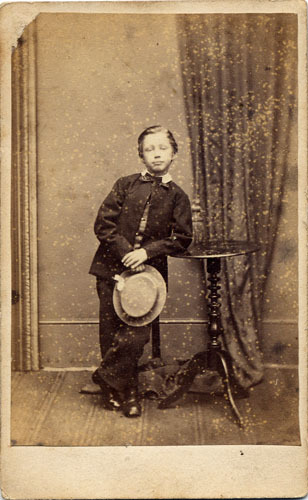 Subject: Unidentified boy with hat, aged about 9 to 11 years, full length standing portrait with curtain, table and patterned carpet. Card Type: Type 11 - Crown, shield, leaves & frame, Blue ink on white card. Notes: Thin card. Square corners. 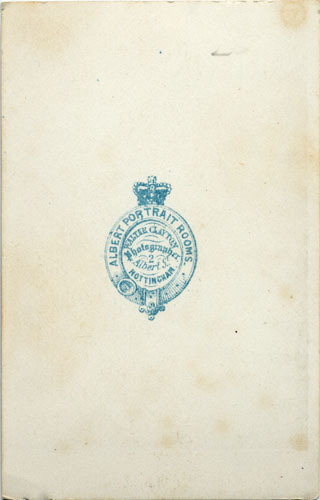 Inscribed, "Thomas Preston Burythorpe House 1870 -" on the reverse. 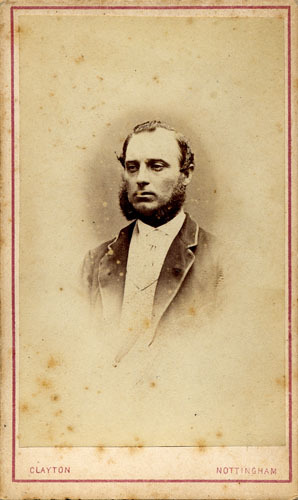 Subject: Thomas Preston, probably in his late teens or early 20s, vignetted head-and-shoulders portrait. 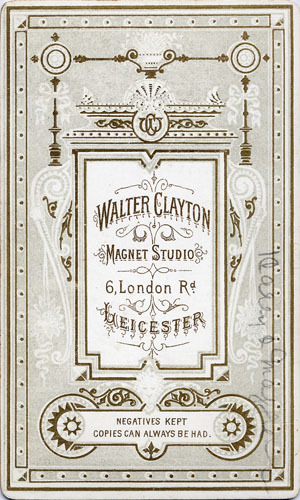 Card Type: Type 12 - Coat of arms, scrolls, ornate shape, double frame, Black and beige ink on white card. Notes: Thin card. Square corners. 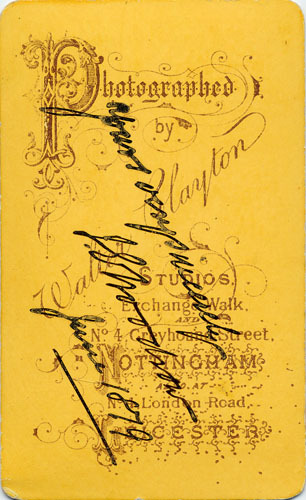 "W. CLAYTON NOTTINGHAM" in black ink on recto. 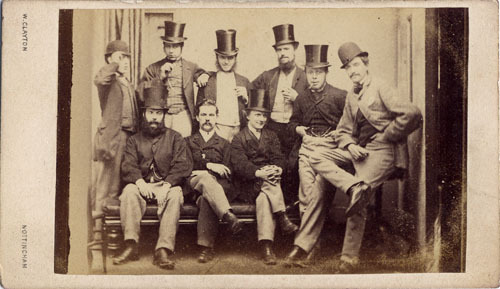 Subject: Group of nine unidentified men in bowler and top hats, probably in their late 20s to early 40s, full length standing/seated portrait with curtain and bench. Card Type: Type 13 - Coat of arms, scrolls, ornate shape, double frame, Pink ink on white card. Notes: Thin card. Square corners. 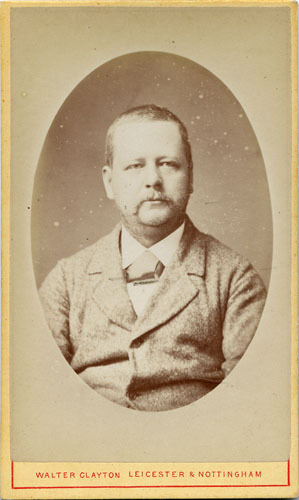 "W. CLAYTON, PHOTO. NOTTINGHAM" in pink ink on recto. 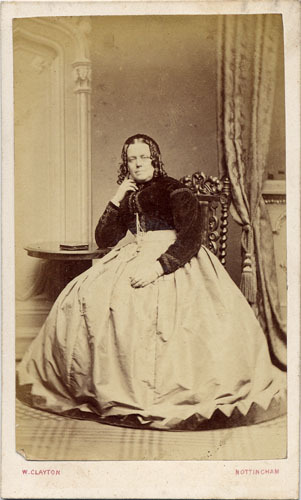 Subject: Unidentified woman, probably in her late 30s or 40s, full length seated portrait with painted backdrop, curtain, chair, table, book and patterned carpet. 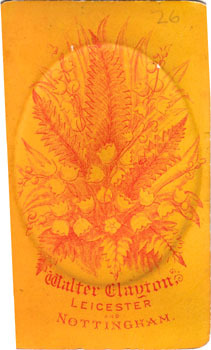 Card Type: Type 14 - Coat of arms, scrolls, ornate shape, double frame with decorated corners, Violet ink on white card. Notes: Thin card. Square corners. 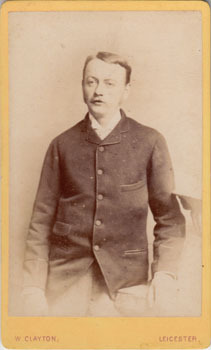 "W. CLAYTON, PHOTO. NOTTINGHAM" in violet ink on recto. 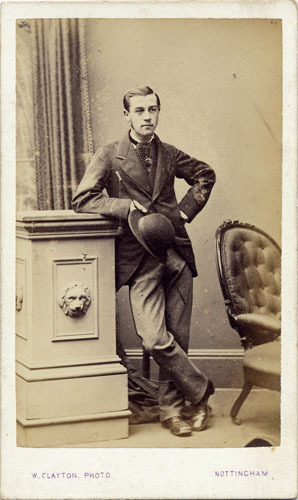 Subject: Unidentified young man with hat, probably in his late teens or early 20s, full length standing portrait with painted backdrop, curtain, chair and pedestal. Card Type: Type 15 - Purple ink on white card. Notes: Thin card. Square corners. 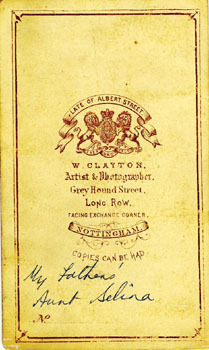 "Albert Street, near Post Office" crossed out in purple ink on verso. "W. CLAYTON PHOTO. 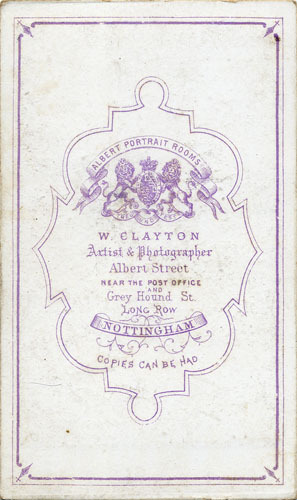 NOTTINGHAM" printed in purple ink on recto. 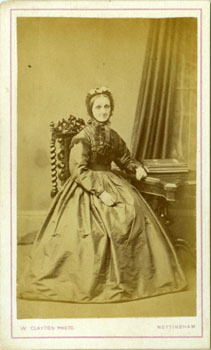 Subject: Unidentified elderly woman, possibly in her 60s or 70s, full length seated portrait with curtain, table and album. Notes: Thin card. Square corners. 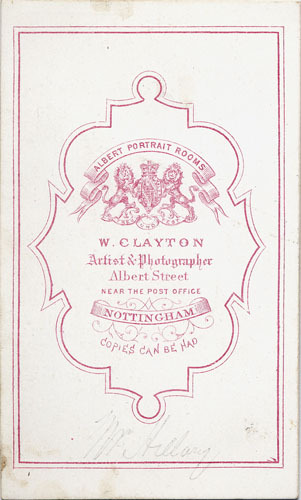 "Albert Street, near Post Office" crossed out in purple ink on verso. 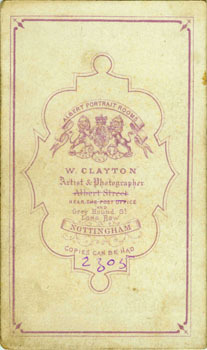 "W. CLAYTON PHOTO NOTTINGHAM" printed in purple ink on recto. 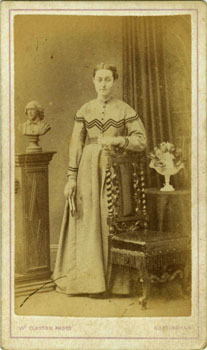 Subject: Unidentified young woman holding a book, possibly in her late teens or early 20s, full length standing portrait with curtain, plinth, bust, table, chair and vase of flowers. 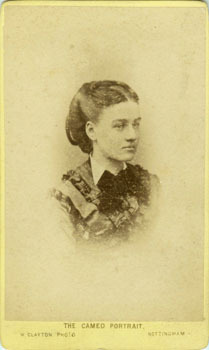 Subject: Unidentified young woman, possibly in her 20s, vignetted head-and-shoulders portrait. Notes: Thin card. Square corners. 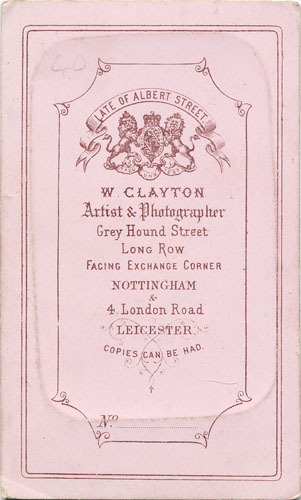 "CLAYTON NOTTINGHAM" and single frame printed in pink ink on recto. 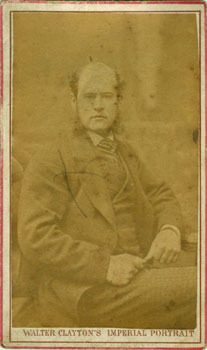 Subject: Unidentified man, probably in his late 20s or 30s, vignetted head-and-shoulders portrait. Card Type: Type 18 - Brown ink on buff card. Notes: Thin card. Square corners. "W. CLAYTON PHOTO. 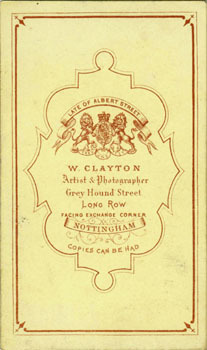 NOTTINGHAM" and single frame printed in brown ink on recto. 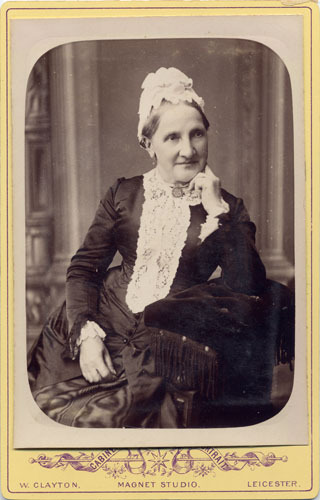 Subject: Unidentified elderly woman holding a book, possibly in her 60s, full length seated portrait with curtain and table. 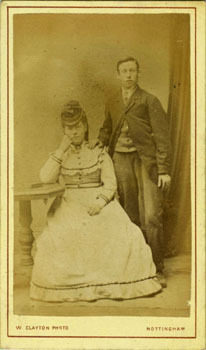 Subject: Unidentified young woman and man, possibly in their early 20s, full length seated/standing portrait with curtain, table and book. 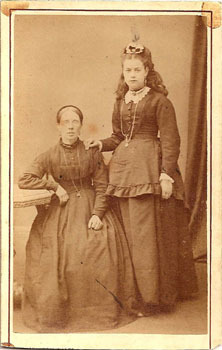 Subject: Two unidentified women, one in her 40s or 50s, the other possibly in her mid- to late teens, full length seated/standing portrait with curtain and table. Card Type: Type 19 - Black ink on buff card. Notes: Thin card. Square corners. "W. CLAYTON PHOTO. NOTTINGHAM" and single frame printed in black ink on recto. 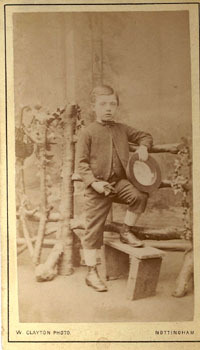 Subject: William Albert Williams (born 1865) with hat and gloves, aged about 6 to 8 years, full length standing portrait with rustic wooden fence and painted rural backdrop. Card Type: Type 20 - Brown ink on buff card. 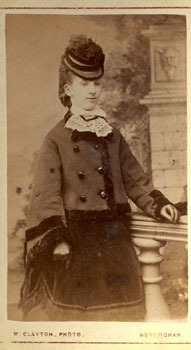 Subject: Emily Williams (born 1855) aged about 16 to 18 years, three-quarter length standing portrait with painted backdrop and balustrade. 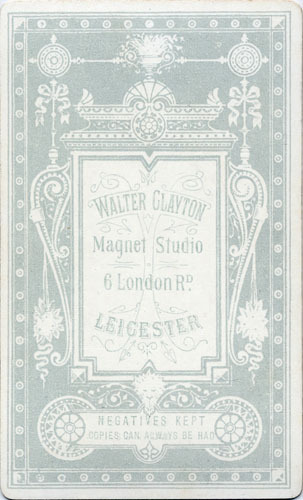 Card Type: Type 21 - Olive ink on buff card, by E.O. Notes: Thin card. Rounded corners. 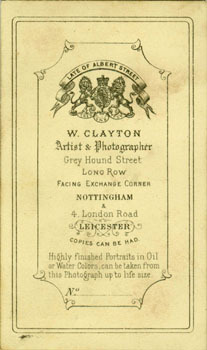 "THE CAMEO PORTRAIT W. CLAYTON PHOTO NOTTINGHAM" printed in olive ink on recto. Inscribed "Oct 1873" on verso. 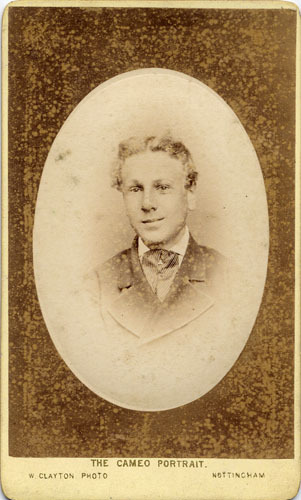 Subject: Unidentified young man, probably in his late teens to early 20s, vignetted head-and-shoulders portrait in cameo frame. Notes: Thin card. Rounded corners. 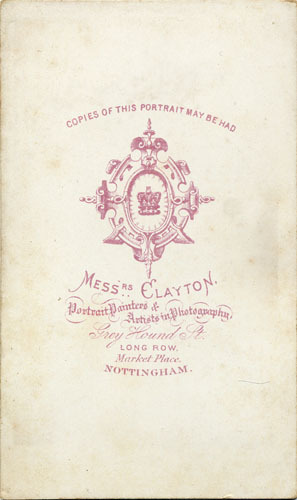 "THE CAMEO PORTRAIT W. CLAYTON PHOTO NOTTINGHAM" printed in olive ink on recto. 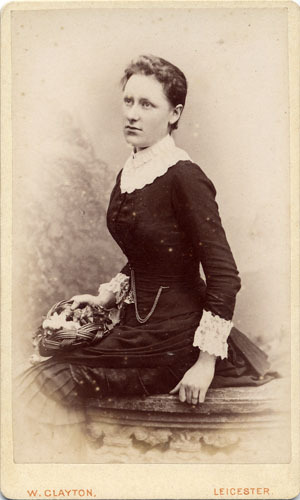 Subject: Unidentified young woman, possibly in her early to mid-20s, vignetted head-and-shoulders portrait. Card Type: Type 22 - Gold ink on pale pink card, by E.O. Notes: Thin card. Rounded corners. 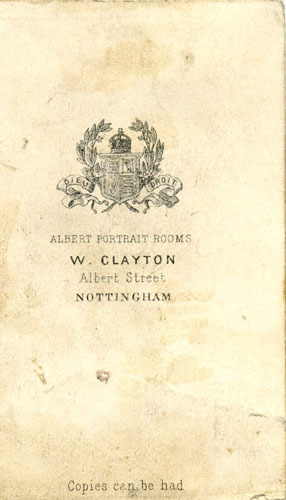 "THE CAMEO PORTRAIT W. CLAYTON PHOTO NOTTINGHAM" printed in gold ink on recto. Card Type: Type 23 - Brown ink on white card, by E.O. Notes: Thin card. Rounded corners. 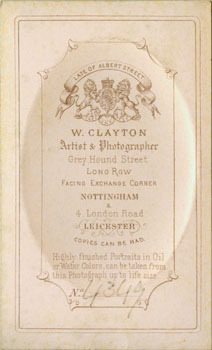 "W. CLAYTON PHOTO NOTTINGHAM" printed in brown ink on recto. 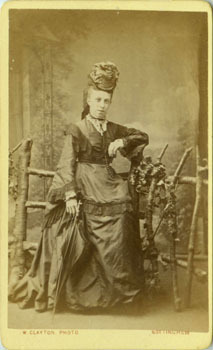 Subject: Unidentified young woman with hat and parasol, possibly in her 20s or early 30s, full length standing portrait with rustic wooden fence and painted rural backdrop. 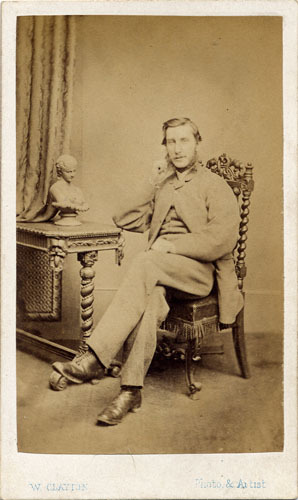 Subject: Unidentified young man, possibly in his early to mid-20s, three-quarter length seated portrait with chair. Card Type: Type 24 - Green ink on white card, by Marion. Notes: Thin card. Square corners. 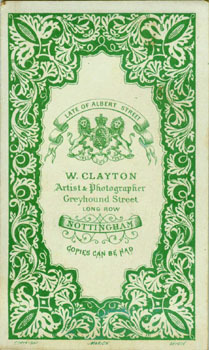 "W. CLAYTON, PHOTO GREYHOUND STREET" printed in green ink on recto. 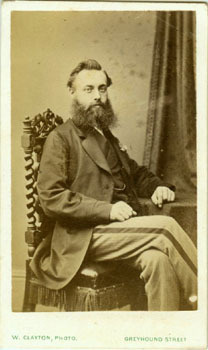 Subject: Unidentified young man with full beard, possibly in his late 20s or early 30s, three-quarter length seated portrait with curtain, table and chair. 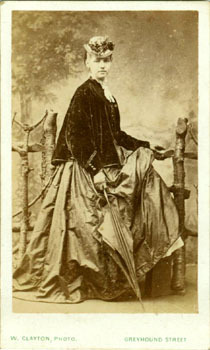 Subject: Unidentified young woman with hat and parasol, possibly in her early 20s, full length standing portrait with rustic wooden fence and painted rural backdrop. Card Type: Type 25 - Purple ink on buff card. Notes: Thin card. Rounded corners. "THE BERLIN PORTRAIT" printed in purple ink on recto. 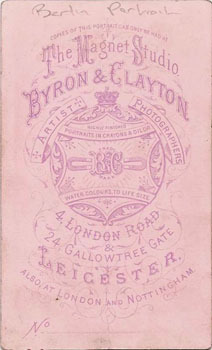 Card Type: Type 26 - Purple ink on pink card. Notes: Thin card. Rounded corners. Red outer and purple inner rectangular frames, and "THE BERLIN PORTRAIT" printed in purple ink on recto. 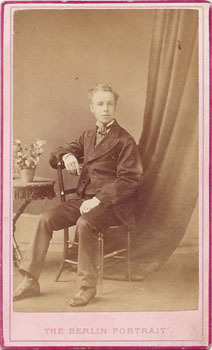 Subject: Unidentified young man, possibly in his late teens or early 20s, full length seated portrait with table, chair and curtain. Card Type: Type 27 - Black ink on white card. Notes: Thin card. Square corners. 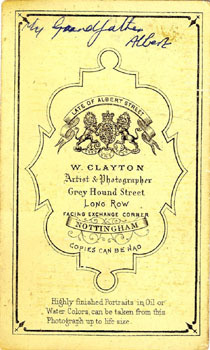 "W. CLAYTON NOTTINGHAM" printed in black ink on recto. 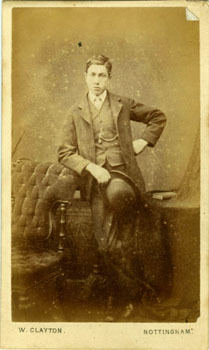 Subject: Unidentified young man with a bowler hat, probably in his mid- to late teens, full length standing portrait with curtain, chair, table and book. 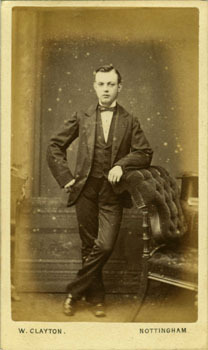 Subject: Unidentified young man, probably in his early 20s, full length standing portrait with painted backdrop, chair, table, book and top hat. 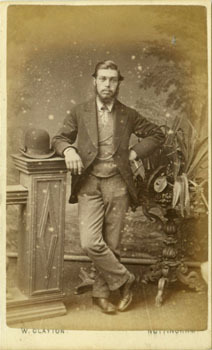 Subject: Unidentified young man with beard and moustache, probably in his early to mid-20s, full length standing portrait with painted backdrop, plinth, table, pot plant and bowler hat. 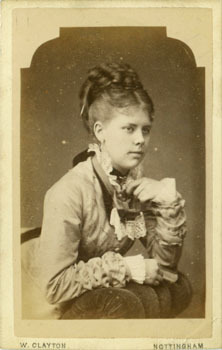 Subject: Unidentified young woman, probably in her late teens to early 20s, half length standing portrait leaning on chair. Card Type: Type 28 - Brown ink on white card. Notes: Thin card. Rounded corners. Red/brown double frame and "WALTER CLAYTON'S IMPERIAL PORTRAIT" printed in brown ink on recto. 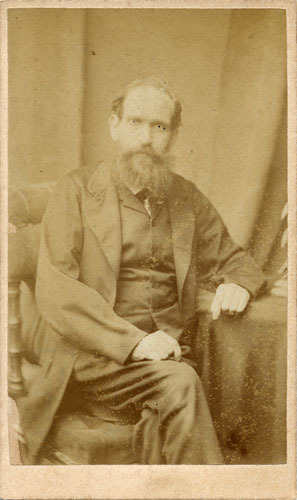 Subject: Unidentified man with side whiskers, probably in his 40s, three-quarter length seated portrait. Card Type: Type 29 - Brown ink on pinkish-white card. Notes: Thin card. Square corners. 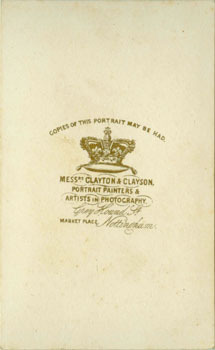 Red frame and "WALTER CLAYTON'S IMPERIAL PORTRAIT" printed in brown ink on recto. 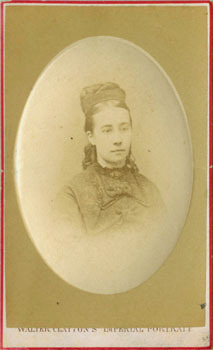 Subject: Unidentified woman with hat, probably in her late 20s or early 30s, vignetted head-and-shoulders portrait. 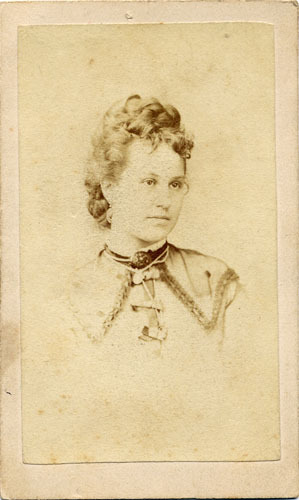 Subject: Unidentified woman, possibly in her 40s, vignetted head-and-shoulders portrait. Card Type: Type 30 - Brown ink on pale pink card. Notes: Thin card. Square corners. Red and brown frames and "WALTER CLAYTON'S IMPERIAL PORTRAIT" printed in brown ink on recto. 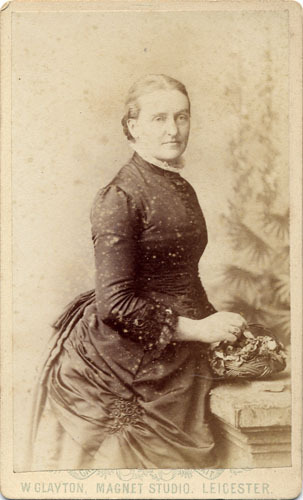 Subject: Unidentified woman, probably in her 20s, three-quarter length standing portrait with painted backdrop, chair and table. Card Type: Type 31 - Black on white card. Subject: Unidentified man, probably in his late 40s or 50s, three-quarter length seated portrait with curtain, chair and table. 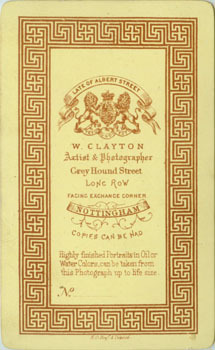 Card Type: Type 32 - Brown on buff card. Notes: Thin card. Square corners. 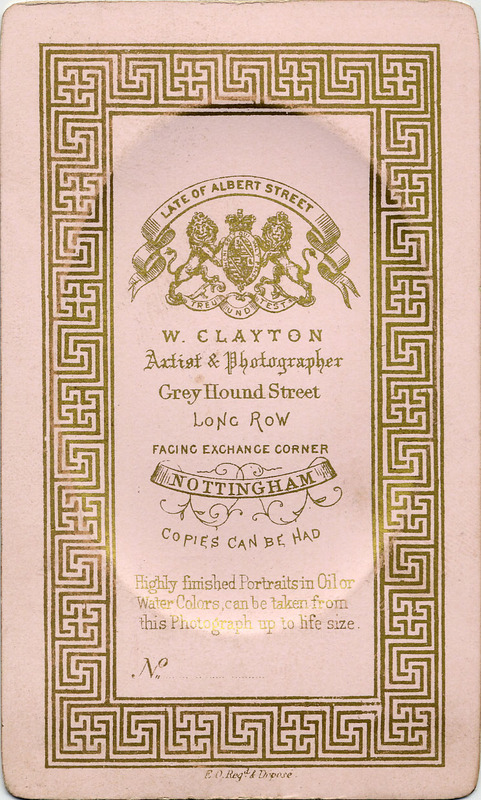 Brown frame and "-CARTE IMPERIAL-" printed in brown ink on recto. 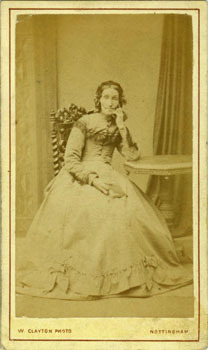 Subject: Unidentified woman, probably in her late 20s or 30s, three-quarter length seated portrait with curtain and chair. Card Type: Type 33 - Purple on light pink card. Notes: Thin card. Square corners. Purple frame and "-CARTE IMPERIAL-" printed in purple ink on recto. 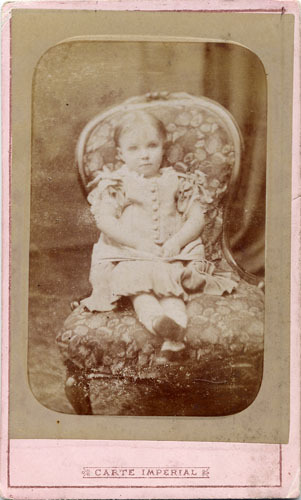 Subject: Unidentified young child, probably aged 3-4 years, full length seated portrait with curtain and chair. Card Type: Type 34 - Purple ink on white card. Notes: Thin card. Square corners. 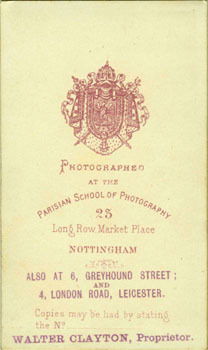 Purple rectangular frame, "PARISIAN SCHOOL OF PHOTOGRAPHY" and small coat of arms printed in purple ink on recto. 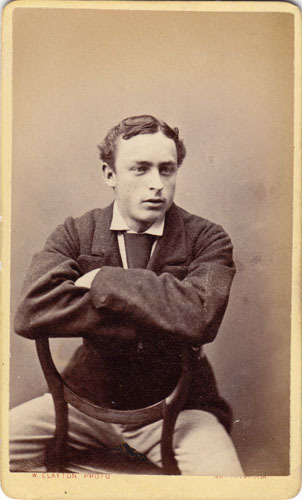 Subject: Unidentified young man, probably in his mid-20s, three-quarter length seated portrait with leaning chair. Artist: W. Clayton of Greyhound St, Market Place, Nottingham, also 4 London Road, Leicester. 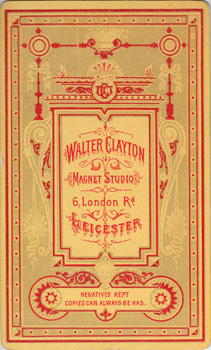 Card Type: Type 35 - Maroon & red ink on pale yellow card. Notes: Thin card. Square corners. Central oval area raised. 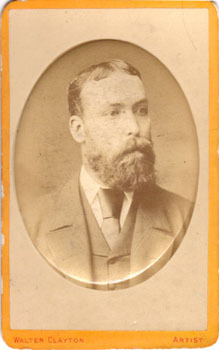 Subject: Unidentified bearded man, probably in his 30s, head-and-shoulders portrait in cameo frame. Artist: Walter Clayton of Greyhound St, Long Row & Exchange Walk South Parade, Market Place, Nottingham, also 4 London Road, Leicester. Card Type: Type 36 - Brown & red ink on white card. 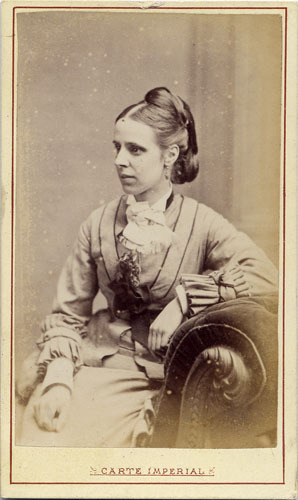 Subject: Unidentified woman, probably in her late 20s or 30s, half-length standing portrait with painted backdrop and chair in archway-shaped frame. Card Type: Type 37 - Black ink on white card. 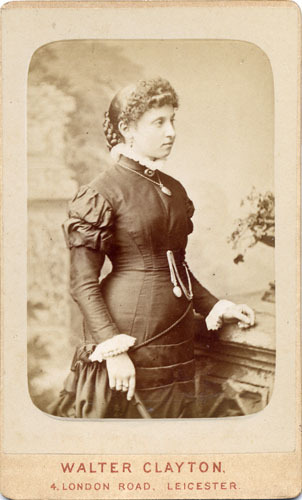 Subject: Unidentified young woman, probably in her early to mid-20s, three-quarter length standing portrait with pedestal. Artist: Walter Clayton, 4 London Road, Leicester (also Nottingham & London). 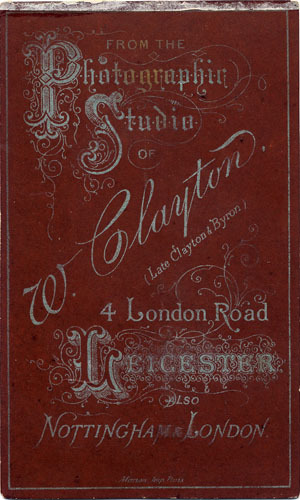 Card Type: Type 38 - Red ink on buff card. Notes: Thin card. Square corners. 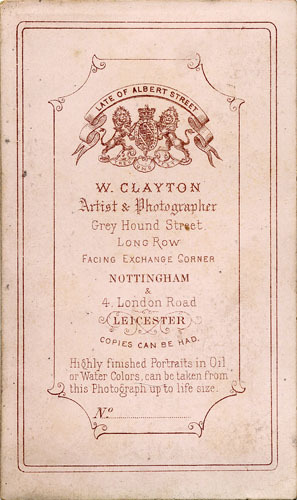 Single frame and "WALTER CLAYTON LEICESTER & NOTTINGHAM" printed in red ink on recto. Subject: Unidentified man, probably in his late 30s or 40s, half length portrait in cameo frame. 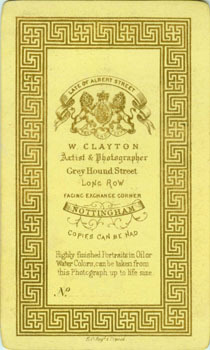 Card Type: Type 39 - Brown ink on yellow card. Notes: Thick card. Rounded corners. 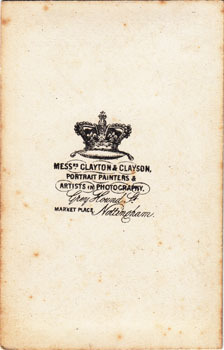 "Cabinet Portrait W. CLAYTON, LEICESTER & NOTTINGHAM" and "WC" monogram printed on front in brown ink. Subject: Unidentified man, probably in his 30s or early 40s, half length portrait in cameo frame. Artist: W. Clayton (Late Byron & Clayton), 4 London Road, Leicester (also Nottingham & London). Card Type: Type 40 - Gold ink on white card. Notes: Thin card. Square corners. 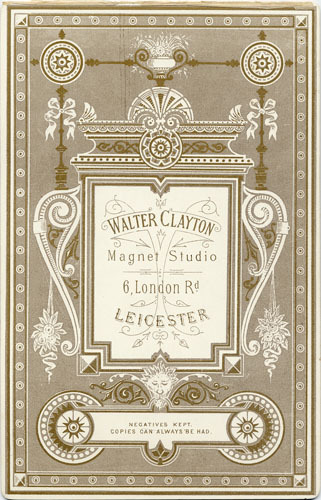 "W. CLAYTON LEICESTER" printed in gold ink on recto. 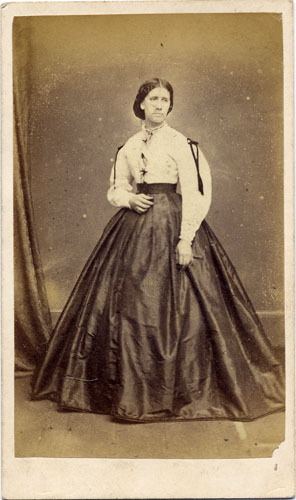 Subject: Unidentified young woman, probably in her late teens or early to mid-20s, three-quarter length standing portrait with curtain and pedestal. Card Type: Type 41 - Silver ink on dark brown glossy card. Notes: Thick card. Square corners. Single frame and "CAMEO REMBRANDT" printed in silver ink on recto. 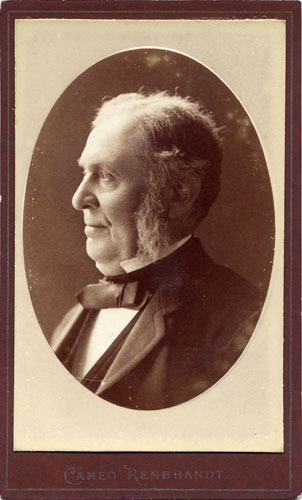 Subject: Unidentified elderly man, probably in his 60s or early 70s, head-and-shoulders portrait in cameo frame. Card Type: Type 42 - Gold ink on dark purple-brown glossy card. Notes: Thick card. Rounded corners. Single frame and "CAMEO REMBRANDT" printed in gold ink on recto. 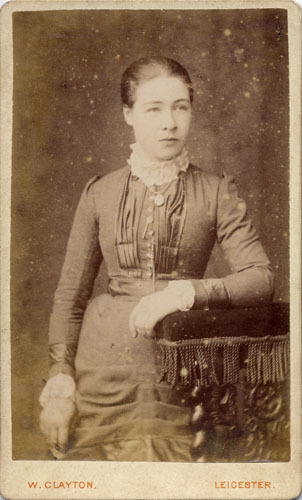 Subject: Unidentified woman with gloves, probably in her 30s, three-quarter length standing portrait with painted backdrop and pedestal. Card Type: Type 43 - Red ink on yellow card. Notes: Rounded corners. 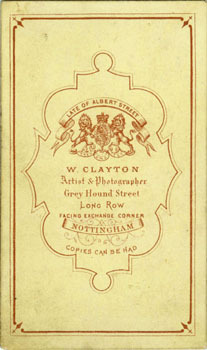 "WALTER CLAYTON NOTTINGHAM & LEICESTER" printed in red ink on recto. Inscribed "Harold Shove" in black ink on recto. 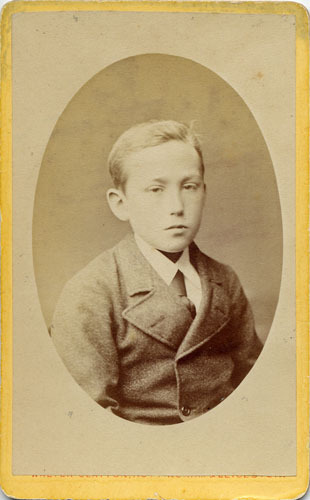 Subject: Harold Shove, probably aged 10 to 12 years, half length portrait in cameo frame. Notes: Square corners. 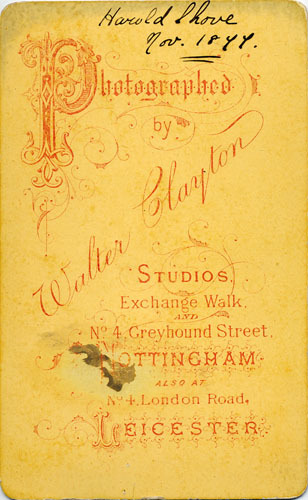 "WALTER CLAYTON NOTTINGHAM & LEICESTER" printed in red ink on recto. 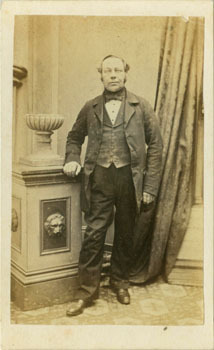 Subject: Unidentified young man, probably in his 20s, three-quarter length standing portrait with plinth. Card Type: Type 44 - Red ink on light orange card. Notes: Rounded corners. 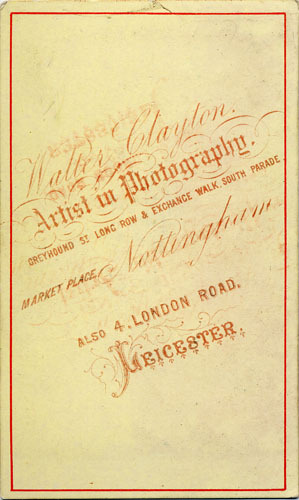 "WALTER CLAYTON NOTTINGHAM & LEICESTER" printed in red ink on recto. 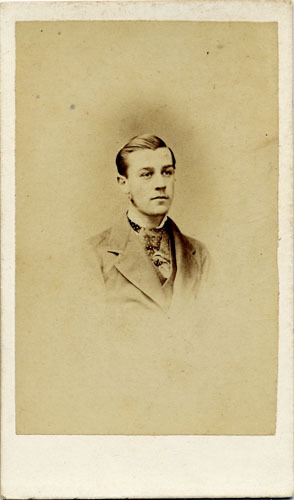 Subject: Unidentified young man, probably in his 20s, three-quarter length standing portrait with pedestal. Card Type: Type 45 - Brown ink on yellow card. Notes: Rounded corners. 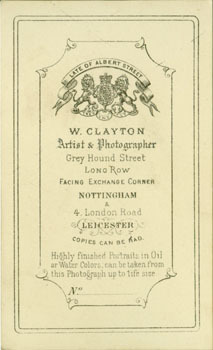 "WALTER CLAYTON NOTTINGHAM & LEICESTER" printed in brown ink on recto. 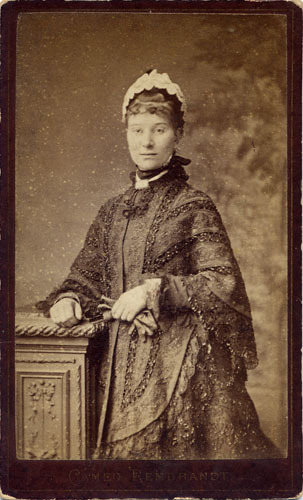 Subject: Unidentified young woman with hat, probably in her late 20s or early 30s, three-quarter length standing portrait with painted backdrop and pedestal. Notes: Rounded corners. 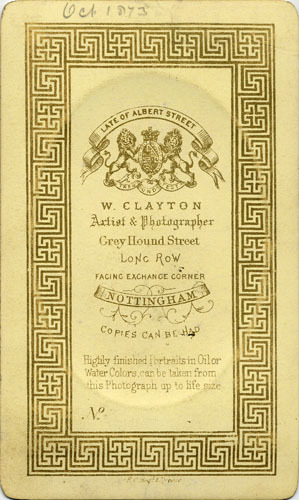 "WALTER CLAYTON NOTTINGHAM & LEICESTER" printed in brown ink on recto. Inscribed "Yours very sincerely J.E. Woodrow June 1879" on recto. 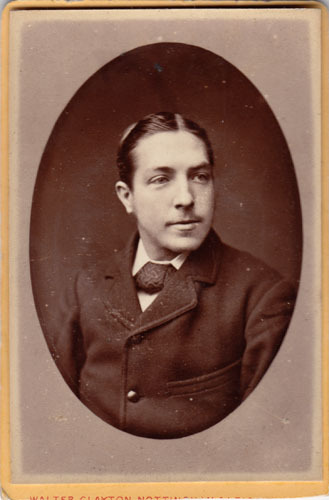 Subject: John Edwin Woodrow (1846-1913), aged 31, vignetted head-and-shoulders portrait. Card Type: Type 46 - Red ink on orange-yellow card. Notes: Rounded corners. 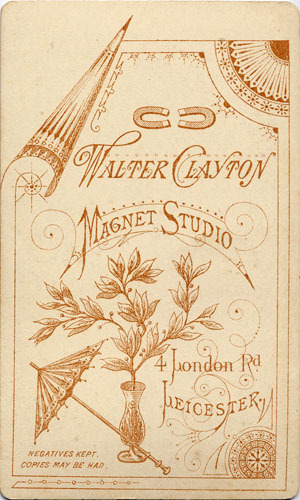 "WALTER CLAYTON ARTIST" printed in red ink on recto. 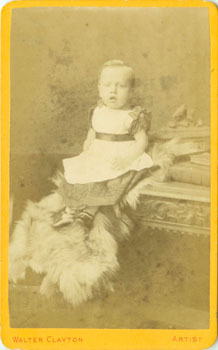 Subject: Unidentified young child, probably aged about 2 years, full length seated portrait with writing desk, fur and books. Notes: Rounded corners. 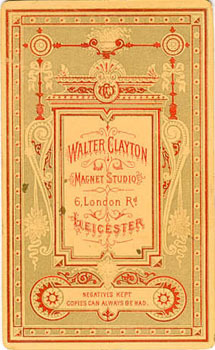 "WALTER CLAYTON ARTIST" printed in red ink on recto. Raised centre frame. 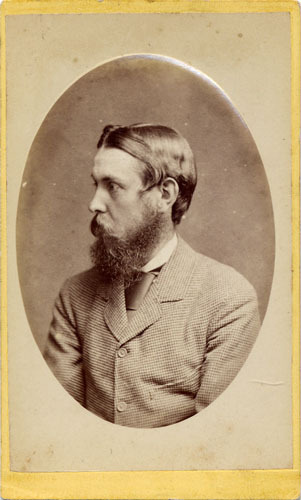 Subject: Unidentified man with beard, probably in his 30s, head-and-shoulders portrait in oval cameo frame. 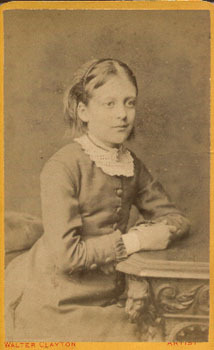 Subject: Unidentified girl (Farmer family), probably aged 12 to 14 years, three-quarter length seated portrait with table. 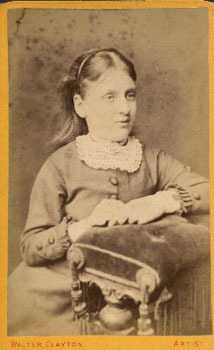 Subject: Unidentified girl (Farmer family), probably aged 11 to 13 years, three-quarter length seated portrait with leaning chair. Notes: Rounded corners. 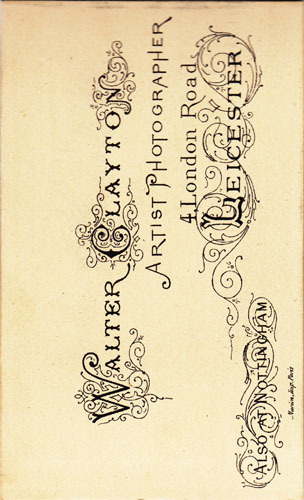 "WALTER CLAYTON ARTIST" printed in red ink on recto. Photograph pasted upside down on mount. 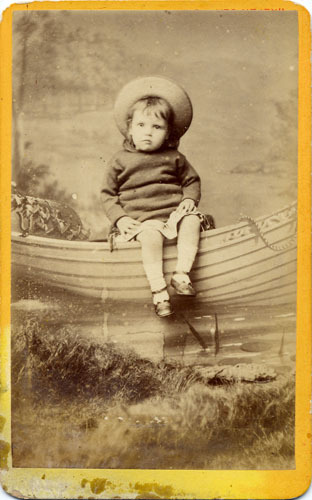 Subject: Unidentified child, probably aged 2-3 years, full length seated portrait with painted backdrop, including boat, and "grass" in foreground. Card Type: Type 47 - Brown ink on buff card. Notes: Rounded corners. "WALTER CLAYTON. 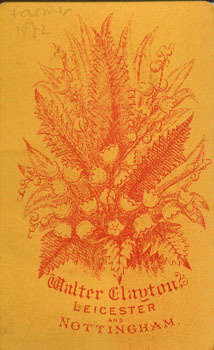 ARTIST" printed in brown ink on recto. 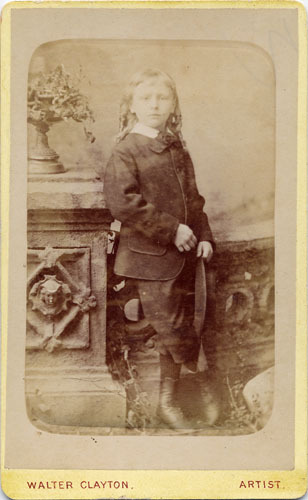 Subject: Unidentified boy with hat, probably aged 9-11 years, full length standing portrait with pedestal, balustrade, rock, foliage and vase with flowers. 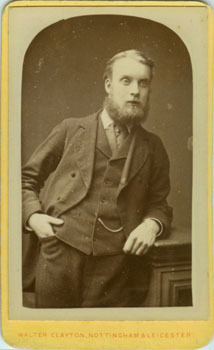 Subject: Unidentified young man, probably in his late teens, three-quarter length standing portrait with pedestal, balustrade, foliage and vase with flowers. Card Type: Type 48 - Brown ink on buff card. Notes: Rounded corners. 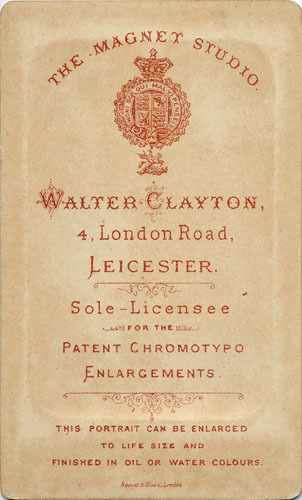 "WALTER CLAYTON, 4, LONDON ROAD, LEICESTER" printed in brown ink on recto. 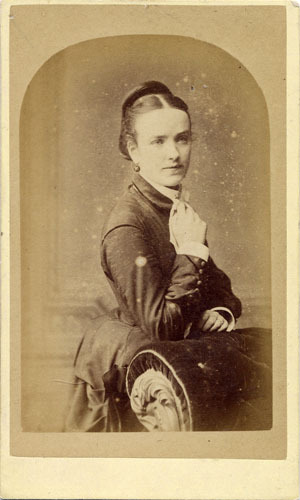 Subject: Unidentified young woman with folded fan, probably in her late teens or early 20s, three-quarter length standing portrait with painted backdrop, pedestal and vase with flowers. Card Type: Type 49 - Orange-brown ink on white card. Notes: Rounded corners. 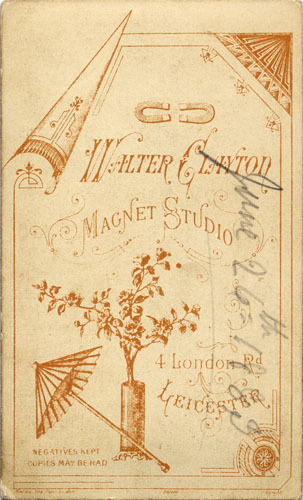 "W. CLAYTON LEICESTER" printed in orange-brown ink on recto. Inscribed "June 26th 1883" in pencil on verso. 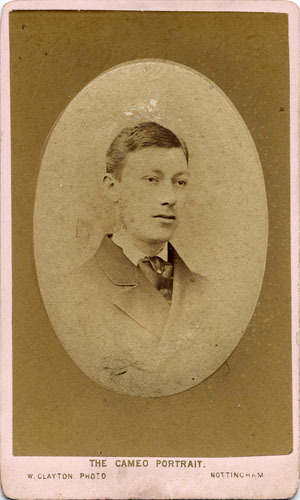 Subject: Unidentified young man, probably in his late teens, vignetted head-and-shoulders portrait. Card Type: Type 50 - Brown ink on white card. 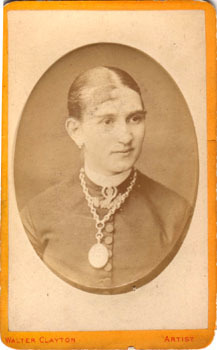 Date: Undated, probably taken c. 1884-1885. Notes: Rounded corners. 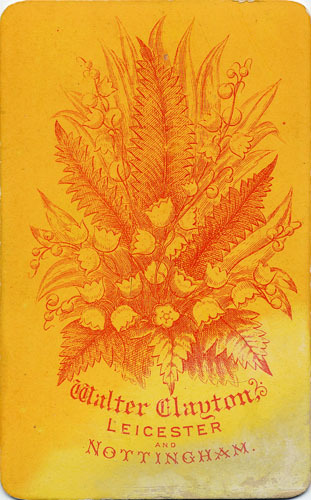 "W. CLAYTON LEICESTER" printed in orange-brown ink on recto. 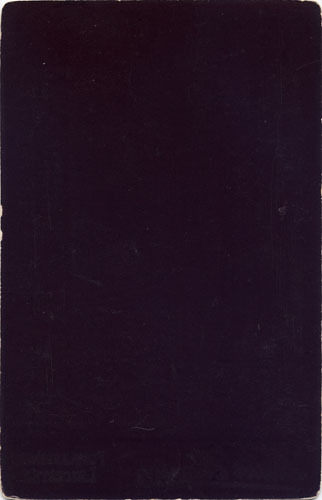 Inscribed "Xmas 1884" in pencil on verso. 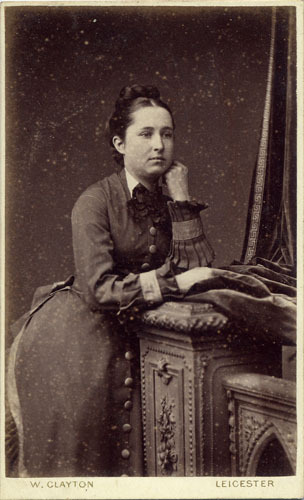 Subject: Unidentified young woman with small basket of flowers, probably in her 20s, vignetted three-quarter length seated portrait with painted backdrop and balustrade. 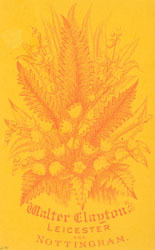 Card Type: 50 - Orange-brown ink on white card. 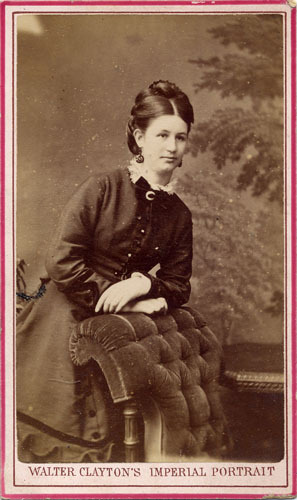 Subject: Unidentified young woman, probably in her late teens or early 20s, three-quarter length standing portrait with chair. Card Type: Type 51 - Orange-brown ink on buff card. Notes: Square corners. 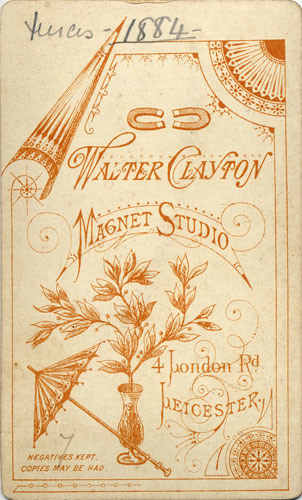 "CABINET PORTRAIT W. CLAYTON MAGNET STUDIO LEICESTER" and scrollwork printed in orange-brown ink on recto. 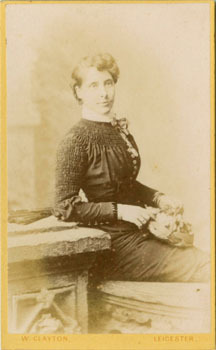 Subject: Unidentified young woman, probably in her 20s, vignetted three-quarter length seated portrait with painted column backdrop, plinth and small basket of flowers. Card Type: Type 52 - Orange-brown ink on buff card. 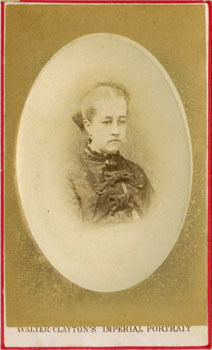 Date: Dated 20 May 1885. Notes: Square corners. 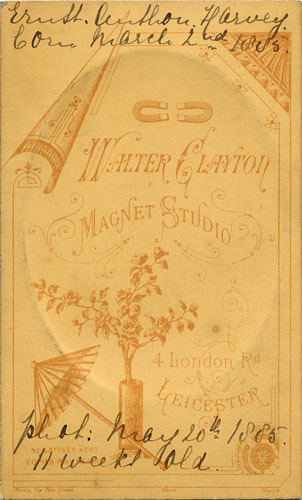 "W. CLAYTON LEICESTER" printed in orange-brown ink on recto. 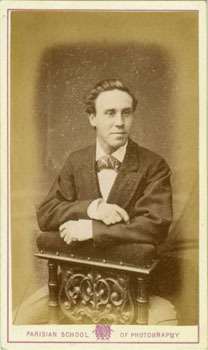 Inscribed "Ernst Anthon Harvey born March 2nd 1885. phot: May 20th 1885. 11 weeks old." in black ink on verso. 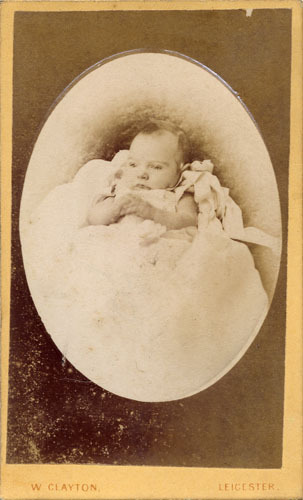 Subject: Ernst Anthon Harvey, aged 11 weeks, vignetted three-quarter length seated portrait, possibly in christening outfit. 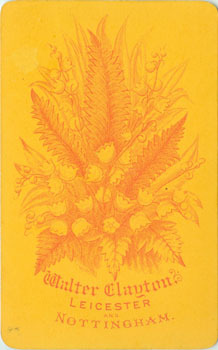 Card Type: Type 52 - Orange-brown ink on light yellow card. Notes: Square corners. 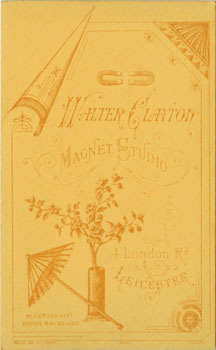 "W. CLAYTON LEICESTER" printed in orange-brown ink on recto. Subject: Unidentified young woman with small basket of flowers, probably in her late 20s or early 30s, vignetted three-quarter length seated portrait with painted column backdrop, plinth and low wall. 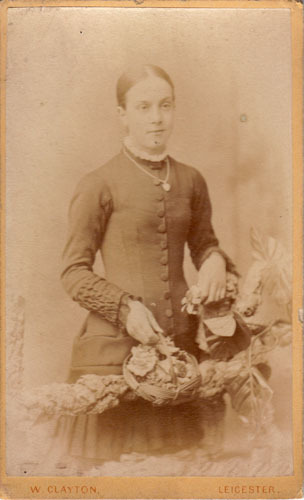 Subject: Unidentified young woman with small basket of flowers, probably in her early to mid-20s, vignetted three-quarter length standing portrait with painted column backdrop, rustic fence and plant. Card Type: Possibly Type 52 - Orange-yellow card. Notes: Rounded corners. 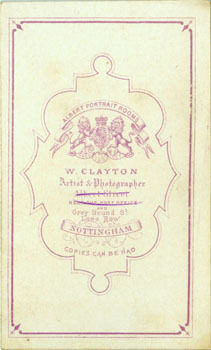 "W. CLAYTON LEICESTER." 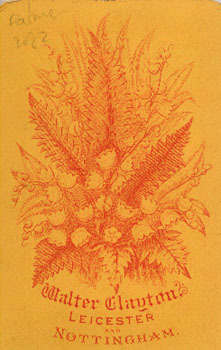 printed in purple-red ink on recto. 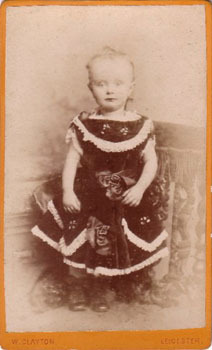 Subject: Unidentified child, probably aged 2 to 3 years, vignetted full length standing portrait. Card Type: Type 53 - Red and grey ink on buff card. Notes: Rounded corners. 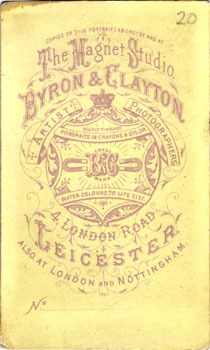 "W. CLAYTON LEICESTER." printed in purple ink on recto. Raised centre frame. 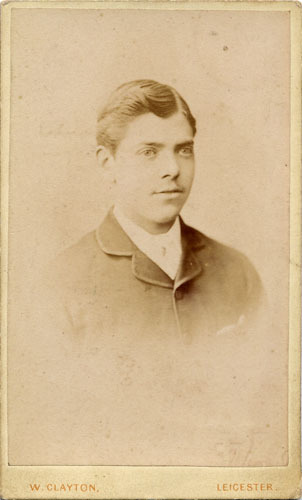 Subject: Unidentified man with moustache, probably in his 20s or early 30s, vignetted three-quarter length standing portrait. Card Type: Type 54 - Orange-red and grey ink on buff card. Notes: Rounded corners. 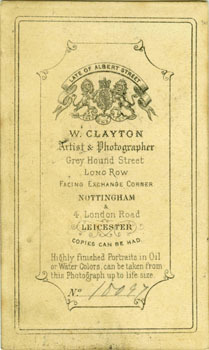 "W. CLAYTON LEICESTER." printed in grey ink on recto (white card). Subject: Unidentified man with moustache and boutonniere, probably in his 20s or early 30s, vignetted head-and-shoulders portrait. Card Type: Type 55 - Gold & dark grey ink on white card. 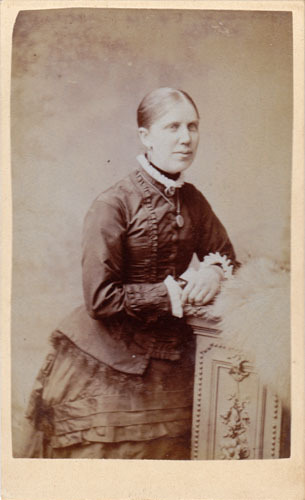 Date: Undated, probably taken c. 1885-1888. Notes: Square corners. "CABINET PORTRAIT. 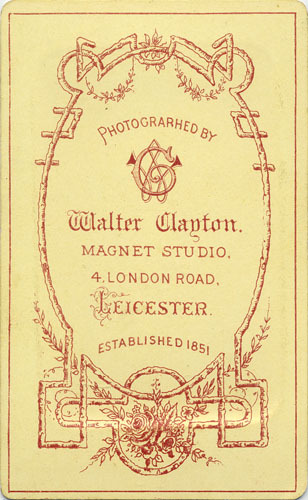 W. CLAYTON, MAGNET STUDIO, LEICESTER." and ribbon/star/staff device printed in purple ink on recto (pale yellow card). Subject: Unidentified woman, probably in her 50s or early 60s, three-quarter length seated portrait with painted backdrop and chair. Card Type: Type 56 - Gold & light grey ink on white card. Notes: Square corners. 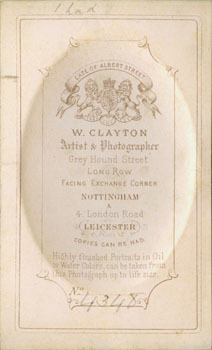 "W. CLAYTON, LEICESTER." 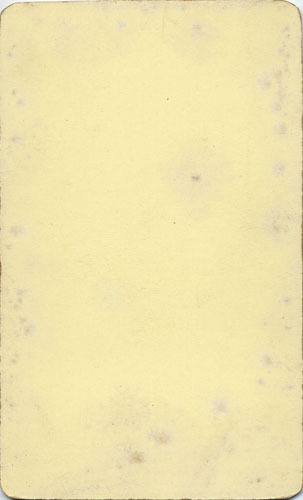 printed in purple ink on recto (pale yellow card). Inscribed "Harry & Maggie" in pencil on verso. 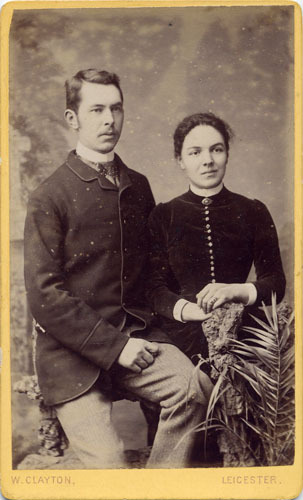 Subject: Unidentified man and woman, probably in their 20s, three-quarter length seated/standing portrait with painted backdrop, rustic fence and plant. Card Type: Type 57 - Light grey ink on white card. Notes: Rounded corners. 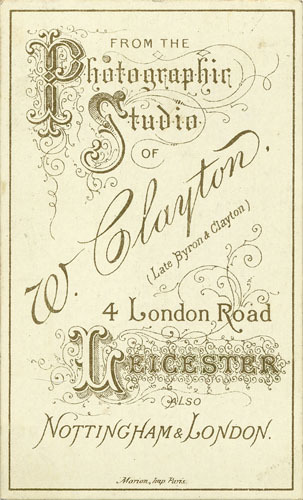 "W. CLAYTON, MAGNET STUDIO, LEICESTER." printed in light grey ink on recto (buff card). 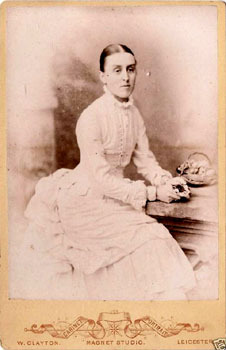 Subject: Unidentified woman with small basket of flowers, probably in her 30s, three-quarter length standing portrait with painted backdrop and pedestal. Card Type: Type 58 - Gold ink on glossy dark purple card. Date: Undated, probably taken c. 1889-1890. Notes: Rounded corners. 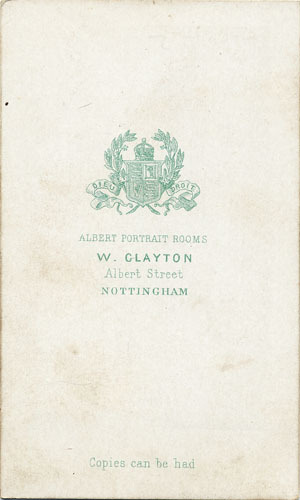 "Walter Clayton PORTLAND HOUSE LEICESTER." printed in gold ink on recto. 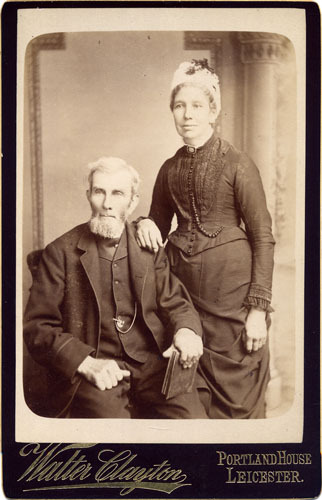 Subject: Unidentified man and woman, he holding a book, probably in their 60s, three-quarter length seated/standing portrait with painted backdrop. Card Type: Type 59 - Gold ink on glossy cream card. Date: Undated, probably taken c. 1891-1892. Notes: Rounded corners. 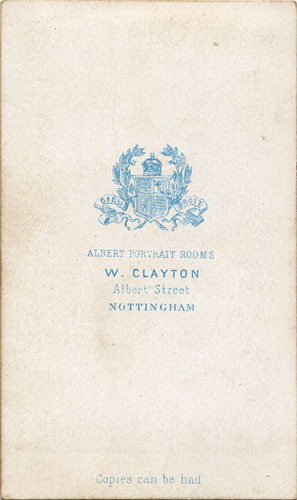 "W. Clayton PORTLAND HOUSE LEICESTER." printed in gold ink on recto. 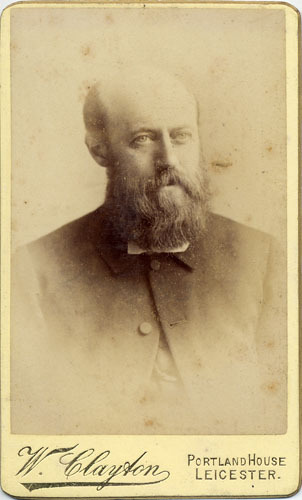 Subject: Unidentified man with a beard, probably in his late 40s or 50s, vignetted head-and-shoulders portrait. Anon (1855) Post Office Directory of Derbyshire & Nottinghamshire, London: Kelly & Co.
Anon (1858) Wright's Nottingham and Suburban Directory for 1858, Nottingham: C.N. Wright. Anon (1862) Wright's Nottingham and Suburban Directory for 1862, Nottingham: C.N. Wright. Anon (1864) History, Gazetteer, and Directory of the County ... of Nottingham, Sheffield: Francis White & Co.
Anon (1867) The Illustrated Police News (London, England), Saturday, 27 July 1867; Issue 180. Anon (1869) Morris & Co.'s Commercial Directory and Gazetteer of Nottinghamshire, Nottingham. 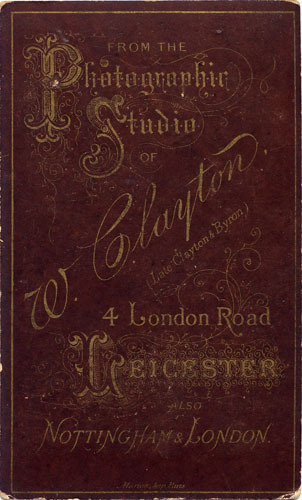 Anon (1875) Commercial & General Directory & Red Book of Leicester. Anon (1877) Morris & Co.'s Commercial Directory and Gazetteer of Nottinghamshire, Nottingham. Anon (1891) Kelly's Directory of Derbyshire, Leicestershire & Rutland, and Nottinghamshire, London: Kelly & Co.
Anon (1895) Kelly's Directory of Leicestershire & Rutland, London: Kelly & Co.
Anon (1959) The New York Times, 11 June 1959. Hannavy, John (1997) Victorian Photographers at Work, Shire Publications, 136p. ISBN 0747803587. 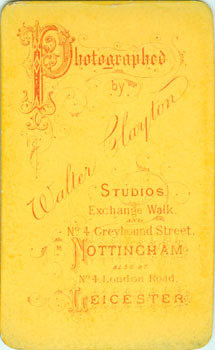 Heathcote, Bernard V. & Heathcote, Pauline F. (1979) Nottingham Photographic Studios in Victorian Times, Bath, England: The Royal Photographic Society Historical Group Newsletter Supplement, No. 42, July 1979. 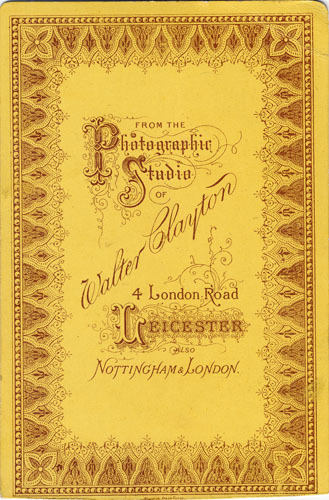 Heathcote, Bernard V. & Heathcote, Pauline F. (1982) Leicester Photographic Studios in Victorian and Edwardian Times, Bath, England: The Royal Photographic Society Historical Group Newsletter Supplement. 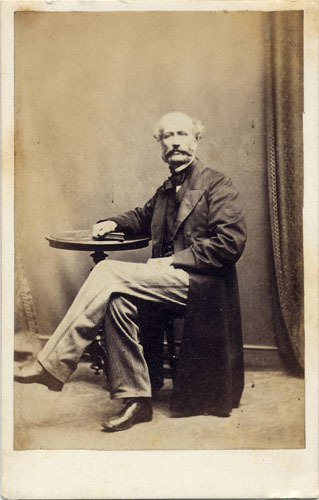 Heathcote, Bernard V. & Heathcote, Pauline F. (2001) Pioneers of Photography in Nottinghamshire 1841-1910. Nottinghamshire County Council. 62p. ISBN 0902751387. Kelly, E.R. (ed.) (1876a) The Post Office Directory of Nottinghamshire, London: Kelly & Co.
Kelly, E.R. (ed.) (1876b) The Post Office Directory of the Counties of Leicester and Rutland, London: Kelly & Co.
Kelly, E.R. (ed.) (1881a) Kelly's Directory of Leicestershire & Rutland, London: Kelly & Co.
Kelly, E.R. (ed.) (1881b) The Post Office Directory of Nottinghamshire, London: Kelly & Co.
Simmons, Peter (1999) Gotham Comes of Age: New York Through the Lens of the Byron Company, 1892-1942, Pomegranate, 216p. ISBN 0764909061. Partially available online from Google Books. White, William (1877) History, Gazetteer and Directory of the Counties of Leicester and Rutland, Sheffield: William White. White, William (1885) History, Gazetteer and Directory of Nottinghamshire, Sheffield: William White. Wright, C.N. (1878) Commercial and General Directory and Red Book of Leicestershire and Rutland, Leicester: C.N. Wright. Wright, C.N. (1880) Commercial and General Directory and Red Book of Leicester & Six Miles Round, Leicester: C.N. Wright. Wright, C.N. 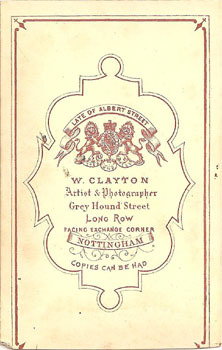 (1883) Wright's Nottingham and Suburban Directory for 1883, Nottingham: C.N. Wright. Wright, C.N. (1884) Commercial and General Directory of Leicester & Fifteen Miles Round, 1883-1884, Leicester: C.N. Wright. Wright, C.N. 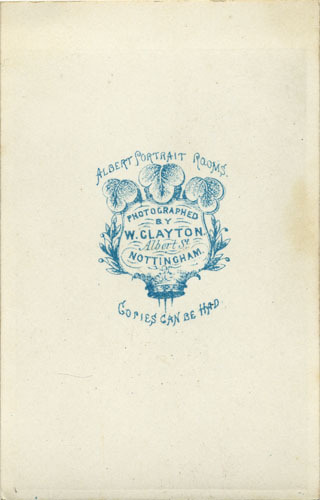 (1885) Commercial & General Directory, Gazetteer, and Blue Book of Nottingham, Nottingham: C.N. Wright. Wright, C.N. 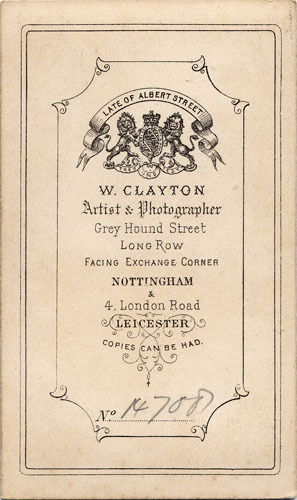 (1888) Directory of Leicestershire, 1887-88, Leicester: C.N. Wright. Wright, C.N. 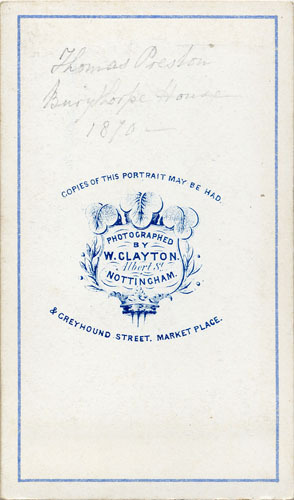 (1889) Directory of Nottingham and Twelve Miles Round, 1888-1889, Nottingham: C.N. Wright. Wright, C.N. 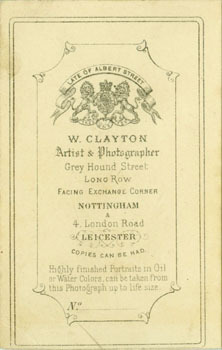 (1890) Directory of Leicester and Twelve Miles Round, 1889-1890, Leicester: C.N. Wright. Wright, C.N. 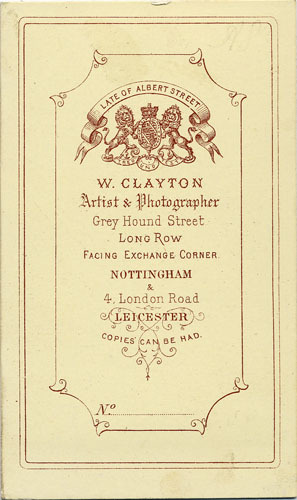 (1892) Directory of Leicestershire, 1892, Leicester: C.N. Wright. Many thanks to Kathleen Maskery, Ron Cosens, Pat Shepherd, Roger Vaughan, Janet Bitton and Brenda Jackson for kind contributions of images and information. © 2006-2011 Brett Payne unless otherwise stated.